I received an email last night kindly pointing out that my calling Realtor.com out on a spelling error as being petty and superior. Had almost anyone else said that, I likely would have brushed it off. The respect I hold for this person caused me to think and conclude – He was right. For those uninitiated, Realtors send their listing information to Realtor.com, which is operated by Move.com which has a contractual relationship with the National Association of Realtors. Move.com is a public, for-profit entity. NAR is a member-services organization. 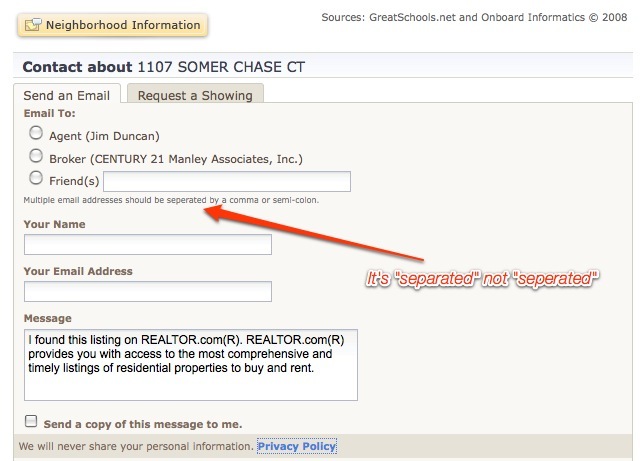 So – Realtors get the listings, send them to Realtor.com for free, who in turn “enhance” them and sell these enhancements back to Realtors. We’re just working against ourselves. Not taking the time to spellcheck a multi-million dollar webpage is indicative of a lack of regard for the readers and the members, and I as a “customer“ (those are big sarcastic quotation marks, by the way) am offended (in as much as I can allow a misspelling to offend me; but when a page that I purportedly support is being marketed to my potential customers, I do take a mild bit of offense). Was it petty to post about a simple misspelling? Sure. Should I have emailed Realtor.com and told them? Probably; but I have no idea whom I should contact, nor do I have any confidence that it would be fixed. Seriously, is it too much to ask for “REALTOR.comÂ® is the official site of the National Association of REALTORSÂ® and is operated by Move, Inc.” to ensure that there are not misspellings on its pages? I do kind of like the comprehensive display of information on the page, though. Thanks as always for the comment. I see Realtor.com as the competition, a site that Realtors should control and one that should benefit Realtors. I pay for both MLS access and local association dues as well as for the website(s). Realtor.com gets the data for free (if I’m not mistaken) and then sells “upgrades” back to us – versus my ideal of a Realtor.com being much like MLS.ca – no ads, a benefit for all Realtors. The fees I pay are admittedly nominal when compared with the potential (and hopeful) benefit … but I do pay something versus RDC’s paying nothing at all. I’d say it’s the “principle of the matter,” but that argument typically loses me when I hear it made … but, I do pay something. Further, I would be fine with having the listing brokers’ branding within my IDX feed (my personal opinion, so long as it’s MLS-wide) – but I understand that that is a political no-go, apparently. There are MLS’ that are pulling their feeds from RDC because they do not get the benefit from it that they should. Another matter is the credibility of the site/mistrust that permeates the Realtor community within which I am most familiar. That the FSBO story was not dismissed out of hand last week is a testament to how far RDC needs to come. I forgot the ads – from a pure aesthetic point of view, they clutter up the page, and distract from the listing itself. We should be able to do better than our competition and have a site focused on the properties we are marketing rather than sharing space with the ads. But … I do like the new display of listings. Very good points, Jim. In my opinion, Realtor.com is all about making a profit. Just take an example of virtual tours: you cannot upload a virtual tour (a basic URL link) if the virtual tour provider does not pay Realtor.com a yearly fee. I pay for enhanced membership on Realtor.com and cannot post my virtual tours because my vendor is not “approved” by Realtor.com – meaning my photographer does not pay them a yearly fee. Realtor.com heavily promotes listings with virtual tours and therefore, backhandedly forces a Realtor to switch to another VT provider or force his VT provider to pay up. Nonsense.